"In everything we have to understand, poetry can help." 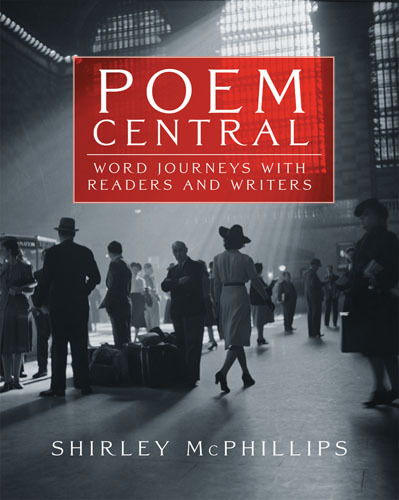 In Poem Central, Shirley McPhillips helps us better understand the central role poetry can play in our personal lives and in the life of our classrooms. She introduces us to professional poets, teachers, and students—people of different ages and walks of life—who are actively engaged in reading and making poems. Their stories and their work show us the power of poems to illuminate the ordinary, to nurture, inspire, and stand alongside us for the journey. Poem Central is divided into three main parts—weaving poetry into our lives and our classrooms, reading poems, and writing poems. Shirley has structured the book in short sections that are easy to read and dip into. Each section has a specific focus, provides background knowledge, shows poets at work, highlights information on crafting, defines poetic terms, features finished work, includes classroom examples, and lists additional resources. In Poem Central—a place where people and poems meet—teachers and students will discover how to find their way into a poem, have conversations around poems, and learn fresh and exciting ways to make poems. Readers will enjoy the dozens of poems throughout the book that serve to instruct, to inspire, and to send us on unique word journeys of the mind and heart. Who Is The Speaker in a Poem?